With AMD gearing up for Capsaicin, its live show where the company is said to be showing off its Polaris architecture, it’s clear the launch of the forth iteration of the GCN based Radeon graphics cards shouldn’t be too far off. Latest rumors show that Nvidia are planning to unveil their Pascal range of graphics cards at GTC (GPU Technology Conference) during April and are aiming for an official release sometime in June for both the GeForce GTX 1080 and the GTX 1070. AMD doesn’t seem to have any intention of giving Nvidia the time advantage, and are also targeting a June launch – which ties in rather nicely with earlier rumors of their hardware. The Polaris range of cards will be created on the 14nm FinFet process, and of course support both HDMI 2.0a and DisplayPort 1.3. What’s rather interesting about all of this is that Nvidia’s GeForce GTX 1080 (and presumably GTX 1070) are reported to not be using the much touted HBM2 (High Bandwidth Memory), but instead GDDR5X, which offers about 14 gbps per pin of bandwidth compared to 7 gbps per pin of the tried and trusty GDDR5. This will allow Nvidia to launch their Pascal lineup a little earlier than otherwise possible due to the limited quantity of HBM2 DRAM chips. 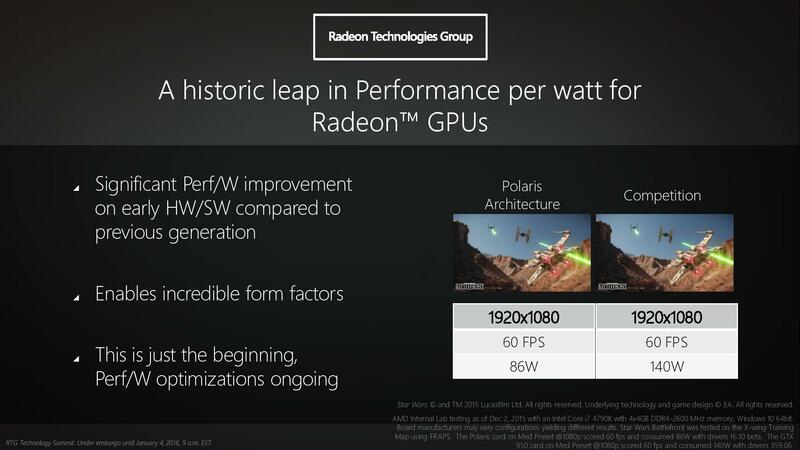 Both companies are pushing the performance per watt envelope, with AMD claiming Polaris offers at least a 2x increase on this number compared to the current third generation of the GCN hardware found in such cards as the Radeon 300 series. With a lot of emphasis on both higher resolution screens (such as 1440P or 4K), increased refresh rates and of course Virtual Reality, the company is aware that the biggest barrier to entry (especially with VR) is the cost. Therefore they are hoping to bring down the cost of Virtual Reality by providing more powerful graphics cards (in other words, a GPU that provides performance over the GeForce GTX 970 or R9 390 minimum) but at under the $350 US Dollar mark. Such a move would benefit headset manufacturers (such as HTC and Oculus) as it would increase the total number of users able to drive the hardware. AMD are investing a lot of time and effort into Virtual Reality, and this is backed up with news that the artist formally known as the Radeon Fury X2 has instead been dubbed the Radeon Pro Duo, and will include some of the elements of AMD’s FirePro lineup. As stated in the opening paragraph in this article, Capsaicin will reveal a lot of information where AMD are heading as a company, so be sure to checkout RGT’s website or YouTube channel for all of the latest updates on graphics and technology news. We’ll of course follow up on Nvidia’s Pascal lineup in April (assuming the rumors are accurate and we see an official unveiling!). Tagged with AMD, amd polaris, geforce, launch, Nvidia Geforce, pascal, PC gaming, polaris release date.